The earliest Chinese paintings in the Ashmolean are dated shortly before the founding of the Museum itself in 1683 and yet, despite the coincidence of the collection’s range with the Museum’s existence, almost all the paintings have been acquired within the last fifty years. This has as much to say about the collecting of Chinese paintings in Europe as about Oxford in particular, for the arts of calligraphy and painting have long been and probably remain more demanding of the unfamiliar viewer than the porcelains, silks, carvings, metalwork and other objects which have been admired for so much longer outside China. Paintings were not evident at all in British collections of Chinese art before the late nineteenth century and were systematically acquired in the two public collections to include them, the Ashmolean Museum and the British Museum, only from the late 1950s onwards. The collections differ in their scope and focus, for while the British Museum has since the 1880s been concerned with acquiring classical Chinese paintings the Ashmolean, since the founding of the Department of Eastern Art in 1963, has built a collection centred on modern, often contemporary, works in the literati tradition. It is these paintings that form the main part of the present catalogue. Prior to the Department’s foundation the Ashmolean’s Chinese collections formed part of the Department of Fine Art and comprised porcelain, metalwork and paintings in late nineteenth-century and early twentieth-century English decorative taste. The porcelains thus belong to that class of well-potted, brightly decorated blue and white or enamelled wares produced between 1700 and 1800 to supply an expanding middle-class market in China and an increasingly middle-class one in England. The metalwork is of similar date and came almost entirely from C. D. E. Fortnum, who presented his collection of Renaissance maiolica and bronzes to the Museum in 1899. Fortnum's oriental bronzes were acquired as examples of technique, to round out his collection along with some classical bronzes, and are a mixture of Chinese and Japanese pieces. The Chinese paintings are for the most part similarly anonymous and decorative: their subjects are principally figures, sometimes representing well-known narratives, and they are executed in bright colours on silk. As such their status in China would have been low, and indeed most of them are the sort of mass-produced works aimed at the market for foreigners working in or visiting China in the nineteenth and early twentieth centuries. They include paintings on paper made of the pith of the tongcao plant (often erroneously called ‘rice' paper paintings) and decorative panels, and are usually designated ‘export watercolours' or ‘trade paintings'. The two hundred or so trade paintings in the Ashmolean have been omitted from the present catalogue but are represented by a few, of slightly better quality, that appear in Appendix Two. Other groups of works acquired before 1962 and excluded from the catalogue are: paintings after Ming and Qing dynasty masters which are of insufficient quality to contribute to the study of those artists' oeuvres; calligraphy, as the holdings are modest; and rubbings, which represent a quite different category of graphic art. In addition to the rubbings the collection includes some woodblock prints, mainly popular pieces in low-quality materials, produced for festivities associated with the New Year. The trade paintings, late copies and ink rubbings do not represent developments in the mainstream of Chinese art, nor, with a few exceptions, is it clear at what point in the early twentieth century they entered the Ashmolean Museum, and yet they are all associated with an increasing awareness of Chinese painting within British understanding of the Far East. An early collection of paintings acquired by a public collection in Britain was that of William Anderson of the Imperial Naval College, Tokyo, purchased by the British Museum in 1881, though the larger part of his collection consisted of Japanese painting. The Chinese works were mostly figure, bird and flower paintings with very few landscapes, and this balance of subject matter still prevails in Chinese Paintings in English Collections, published some forty years later by Laurence Binyon. Landscapes, which do form the mainstream of the Chinese painting tradition, were not displayed prominently or in quantity in Britain until the 1935-36 Chinese Exhibition at Burlington House, when, of more than three thousand objects, the 254 paintings included seventy-six landscapes, of which the greater part was lent by the Chinese government. 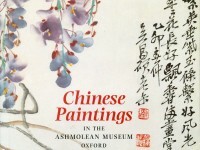 It seems that only later were landscapes collected in Britain on any significant scale, and so the figure paintings in the Ashmolean, if they did enter the Museum much before the founding of the Department of Eastern Art, are in keeping with English taste in Chinese art in the first part of the twentieth century. The same may be said of the tongcao pith paper paintings depicting trades, figures and flowers, often mounted in albums with pale blue ribbon borders. These arrived in England in considerable quantity as early as the eighteenth century and throughout the nineteenth, typically brought back by merchants involved in trading other commodities, to whom they may well have been offered for sale at the ports. While the trade paintings represent a taste in Chinese painting generally shared amongst those who had any familiarity with things Chinese, the ink rubbings and copies after old masters illuminate a more ambitious acquaintance with Chinese culture. The ink rubbings are taken from a mixture of ancient stelae carved with inscriptions and images, and from newer stones re-cut for the purpose of replicating the texts, calligraphic styles and pictorial contents of the original stelae without wearing them away. Most are from well-known monuments in the Beilin (Forest of Stelae), which was founded in the Song dynasty at a Confucian temple in Xi’an, Shaanxi province, as a repository of important literary and official works, and thus show some engagement on the part of those who collected them, with sinology and China’s historical past. The copies of old masters meanwhile venerate not just those artists but also two ever-present and often overlapping currents in Chinese painting: studying from the classics, and simple deception. Copies were produced partly because there was no tradition in China of the public display of painting, and the study of painting therefore depended on the practice to a certain extent; the complexities the consequent traditions of imitation presented to collectors of Chinese painting posed a particularly acute challenge to foreigners, since so little writing on the subject was available in European languages, and, furthermore, identification of paintings is closely tied to the inscriptions and seals they bear. Though the collections of George Eumorfopoulos and Sir Percival David did include early paintings, these did not remotely approach the importance of their ceramic collections, which included numerous pieces from the former Imperial collection. Eumorfopoulos's paintings were sold to the national museums in London in 1935 along with the bulk of his ceramics, bronzes and other objects, while Sir Percival Davids were not included in the great gift of his ceramics collection to London University in 1952 but remained part of his private collection; the best of these were purchased by the Metropolitan Museum, New York, in the late 1970s. A more recent collection of both porcelain and painting, though quite different in taste, was that of Gerald Reitlinger. His bequest to the Ashmolean in 1978 of several thousand Chinese, Japanese, Islamic and European ceramics was accompanied by some fifty trade paintings (not included in the catalogue), so that the balance if not the content of the collection is in keeping with the slightly earlier collecting of Chinese art in England. The study of Chinese art in Oxford can be said to have been initiated and developed by one man, William Cohn. Born in 1880, Cohn arrived in Oxford in 1938 after an already lengthy academic career in Berlin to become Adviser to the University in Eastern Art and later, from 1948 until his retirement in 1955, Director of the Museum of Eastern Art. He was born and educated in Berlin, studying art history (under Wölfflin), archaeology and East Asian ethnology, and, as a postgraduate, philosophy; in his twenties and thirties he travelled in India, Southeast Asia, China, Japan and the USA, and his subsequent publications on Asian art were wide-ranging. He concentrated on Indian art, and the painting and Buddhist sculpture of China and Japan, while editing several academic journals. In 1912 he founded, and until 1935 co-edited with Otto Kümmel, the Ostasiatische Zeitschrift; from 1921 he was editor of the eleven-volume series Die Kunst des Osten, and from 1924 he co-edited the Jahrbuch der Asiatischen Kunst. In 1929 he was appointed curator in the Department of East Asian Art in the Volkerkundemuseum of the Berlin State Museums, and from 1934 to 1938 continued in that museum as Secretary to the Society for East Asian Art (Gesellschaft der Asiatischen Kunst). There is no detailed record of Cohn’s curatorial work, but it is clear from Chinese sources that he was instrumental in the setting up of an important loan exhibition of modern paintings from China under the auspices of the Chinese government. According to one account, the exhibition was conceived when Cohn asked during a seminar in Berlin by the painter Liu Haisu whether it might be possible for him to bring real paintings from China to Berlin to illustrate future lectures. Liu Haisu’s own preface to one of the three publications accompanying the exhibition mentions Cohn as one of a group of scholars involved in planning the exhibition, while a copy of another now in the University’s Eastern Art Library bears a dedication, in his own calligraphy, from Liu to Cohn. A third, much smaller, catalogue includes a complete list of the works displayed; since between 1933 and 1935 both Liu Haisu and the painter Xu Beihong set up exhibitions of their own paintings and of Chinese painting in general in cities throughout Europe, the complete list can be used to trace which works were sold and which continued on tour, or were added. The exhibition had been shown in several German cities, and it seems that, in terms of exhibitions and private collections, Germany was more active in the field of modern paintings, at least, than England at the same period. Understanding of Chinese painting in general was due largely to the work of Cohn himself, and of his erstwhile co-editor and colleague Otto Kümmel, and also of Otto Fischer. All three wrote about Indian, Chinese and Japanese art, though Fischer wrote specifically on Chinese painting as well. At the time of Cohn's arrival in Oxford, English scholarship on Chinese painting was in a slightly different situation from that in Germany, for while Cohn, Kümmel and Fischer all worked exclusively in the field of East Asian art, none of the English writers on the subject was primarily an historian of oriental art. The most prolific was Laurence Binyon (1869-1943), whose Flight of the Dragon (London, 1911), for example, provided an early introduction for English readers to what was an extremely remote subject. Binyon was in charge of the sub-department of oriental prints and drawings at the British Museum from 1913 until 1933, following twenty years in the departments of printed books, and of prints and drawings. He continued to write on European art and is indeed, despite his prominence in the field of Chinese art history, best known for his work on English watercolours and for his plays and poems, most notably For the Fallen (1914), which continues to be recited on Remembrance Day each year. In 1925 Binyon contributed the section on painting to Chinese Art: an Introduction, which was published as a Burlington Magazine Monograph with an introductory essay on Chinese art by Roger Fry (1866-1934), editor of The Burlington Magazine. Fry, a champion of modern art and also uncommonly receptive to non-European art, was enthusiastic about Chinese art, even calling in an essay published in 1926 for greater commitment to the Far East on the part of the national museums. In the same year that the Burlington Monograph appeared, he contributed to an informal collaborative handscroll with some of the most distinguished Chinese artists of the day. There is no later evidence for Fry’s interest in Chinese painting; the claim in a Chinese source that he attended a preview of the 1935 New Burlington Galleries exhibition at the Chinese Ambassador's residence is impossible, and though his Slade Lectures at Cambridge in 1933-4 include Chinese art, his discussions are limited to Buddhist sculpture and ancient bronzes, the latter having become a particular enthusiasm. While as an English painter and art critic Fry undoubtedly was ahead of his contemporaries in recognising the strength of the Chinese painting tradition, his comments on the subject in his collection of writings Vision and Design imply that in fact he regarded Chinese art as one more example of the purity of line and form evident in African, early American and other Primitive art. Indeed his private collection included almost as much African sculpture as Chinese ceramics and bronzes, and seems to have omitted Chinese paintings entirely. While Binyon and Fry wrote effectively about Chinese painting from the standpoint of European art history and criticism, the great linguist Arthur Waley (1889-1966) brought a sinological view to the subject. Though Waley was in the British Museum sub-department of oriental prints and drawings from 1912 to 1929, during which time he catalogued the Buddhist paintings brought from Central Asia by Sir Aurel Stein and wrote An Introduction to the Study of Chinese Painting, he, like Binyon, is better known for other work. His translations from Chinese and Japanese literature were more prolific by far than his writings on Chinese art, and earned him added recognition as a poet. Waley, self-taught in both Chinese and Japanese, was in fact one of the outstanding sinologists of the early twentieth century in Britain. He never accepted a university post — indeed there were few posts in Chinese language and literature in British universities, where it was very much less established as an academic discipline than in Germany. At the time of Cohn’s arrival, the Oxford chair in Chinese, founded in 1876, was held in absentia by Ye Keyin, though the following year an Honours School in Chinese was established. There was a reasonable holding of Chinese books, the Bodleian having accepted successive gifts since the seventeenth century from scholars, former missionaries and colonial servants in China, most notably Edmund Backhouse. The holdings on Chinese art were, however, negligible, the core collection of the University’s present Eastern Art Library being none other than Wiliam Cohn' s own library. Cohn’s first years in Oxford were spent conducting independent research, and included a spell working in the British Museum; it was not until June 1946 that the University appointed him as Adviser in Eastern Art. The idea of an oriental museum was already under discussion within the University, and this duly opened in November 1949 as the Museum of Eastern Art on one floor of the Indian Institute (now the Modern History Faculty) in Broad Street. It was described in the University Handbook of 1952: ‘…it contains the joint collections of Asiatic Art (representing India, Pakistan, Burma, Ceylon, Siam, Indo-China, Indonesia, China, Japan, Korea, Tibet and Islam) of the Ashmolean Museum and the Indian Institute, acquired mostly by gift or loan from old members of the University. Indian Sculpture, and Chinese and Islamic Ceramics and Metalworks are particularly well represented.' It was here that Cohn worked until his retirement in 1955. Peter Swann (1921-97), who had been assistant to William Cohn for several years, was appointed to succeed him. The teaching of Chinese art begun by Cohn as informal seminars was continued by him, more often as supervision of individual students, and has since become an established part of the teaching of the Faculty of Oriental Studies. Swann had more success in acquiring objects by purchase than Cohn had enjoyed, but also oversaw the gift by Sir Herbert Ingram of his substantial collection of early bronzes, jades and ceramics which still forms the main part of the Museum’s pre-Ming Chinese collections; he also oversaw the establishment of the Department of Eastern Art within the Ashmolean in 1963, when the Indian Institute and Ashmolean oriental collections were combined. Swann was particularly interested in painting, and a large proportion of the works in this catalogue was acquired during the period of his keepership (1955-65), assisted from 1962 by Mary Tregear, who joined the Department from Hong Kong University Museum. The difficulties of authentication, expense and availability associated with early paintings, so lamented by Binyon in the 1920s, applied no less thirty years later, and it was decided to concentrate the collection on later Chinese paintings, to which these hindrances applied in much lesser degree. The paintings in the present catalogue are therefore mostly in the traditional medium of ink and colour on paper, and represent the literati tradition as it developed from the late nineteenth century. That same period saw the emergence of new styles of traditional painting centred in Shanghai and Guangzhou (Canton) while more conservative styles prevailed in Peking. The map on p. 21, showing the birthplaces of artists represented in the Museum’s collection, gives an indication of this regional development, while confirming the persistent prominence of the eastern region for poets, painters and scholars. The question of authentication has been less pressing in this field, particularly so since many of the paintings by modern artists were acquired before their work began to be faked; the paintings that follow are considered to be genuine either for that reason, or because there is or has been sufficient opinion in favour of their authenticity, in a field where debate about individual paintings can continue over decades and generations. The early 1960s was the period when many of the major modern works in the Museum were acquired. They were bought mostly from Colletts in London, then run by Mary Shen, who bought direct from China (the gallery, now called Jimei Zhai Eastern Art Gallery, is still run by Mary Shen's partner Colette Hawes). The upheavals of the Cultural Revolution (1966-76) however meant that by the late 1960s, paintings were no longer available from the Chinese mainland, and this is reflected to some extent in the rate of acquisition by the Ashmolean. The Museum continued to purchase paintings, but more intermittently, and more often from private collections. By the time of her retirement in 1991, Mary Tregear had not only acquired some of the finest paintings in the collection, but also extended it back into the late Qing period with a number of nineteenth century and earlier works. Since then the Museum has continued to purchase paintings, but the most significant development has been the gift in 1995 of 130 modern paintings presented in honour of Jose Mauricio and Angelita Trinidad Reyes. This important group, published in 1996, complements the collection in the present catalogue and extends it again, by including some works by young artists painting at the end of the twentieth century. 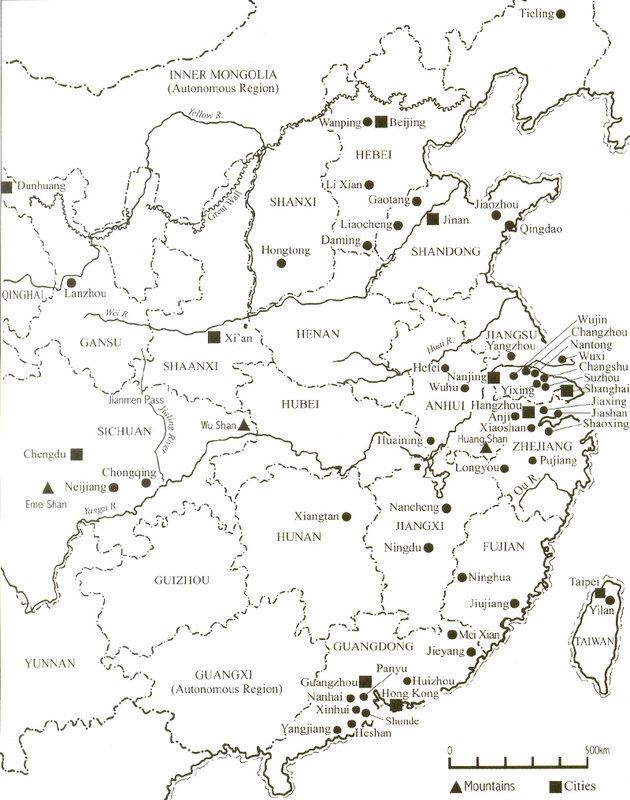 Map of China showing the birthplaces of artists represented in the catalogue.